I love bone soup. Beef shank (that is mostly bone), a lineup of dried Chinese medicinal herbs, shallots, and carrots go into a big pot with water and is simmered for a whole weekend. The broth that results is magical. Serious! With the end result, we used everything but the bone. The fat skimmed off would be saved in the fridge and over the course of the week, used for stir-frying vegetable dishes. All the goopy herby junk would go to compost. And, well of course, the broth would be used for the most amazing soups and noodle soups you’ve ever had. But those bones. What to do with the bones? Finally found a use. In the past month, I opted to time my broth making to the lunar phases, once over the first quarter, a waxing moon, again through the full moon, and a final time through the waning moon, for a total of three cleaned shank bones. I noted how after the long, arduous cooking time for the broth, the shank bones pretty much could be pulled out of the pot clean, just as you see it above. I then rinsed them in rain water (the rainfall being perfectly timed where I live, if I might add, so that I could do that) and then buried the bones in sandalwood and sage ash, which I’ve collected over who knows how many times of burning sandalwood or sage here around the house, plus a quartz crystal for good amplifying measure. The bones will then go through a few more processes this Friday through the new moon, which coincides with the first day of spring. So not only is the bone broth that I’ve made good for my health, but I’ll be able to put these bones to use, too. From the perspective of metaphysical energy, I correspond bone with vitality, vitalism, that so-called élan vital. In animals and us humans, bone has a supporting function. They produce blood and they store our precious minerals, most notably phosphorous and calcium. Phosphorous and phosphorescence calls to mind White Light energy, Qi in its most potent form. That and phosphorous is essential for life as we know it. Calcium is the most abundant metal by mass in healthy animals. The three bones can then be placed together on a decorative plate in the living room, family room, or the center of a living space (which in feng shui corresponds with health and wellness) or–if you’re artsy–you can incorporate the bones into art or sculpture. Use these bones to decorate the living space of one who may need a little extra energetic support for health and wellness. If bone is not exactly palatable to your interior design tastes, there are other uses. I store my pendulums in the bones. 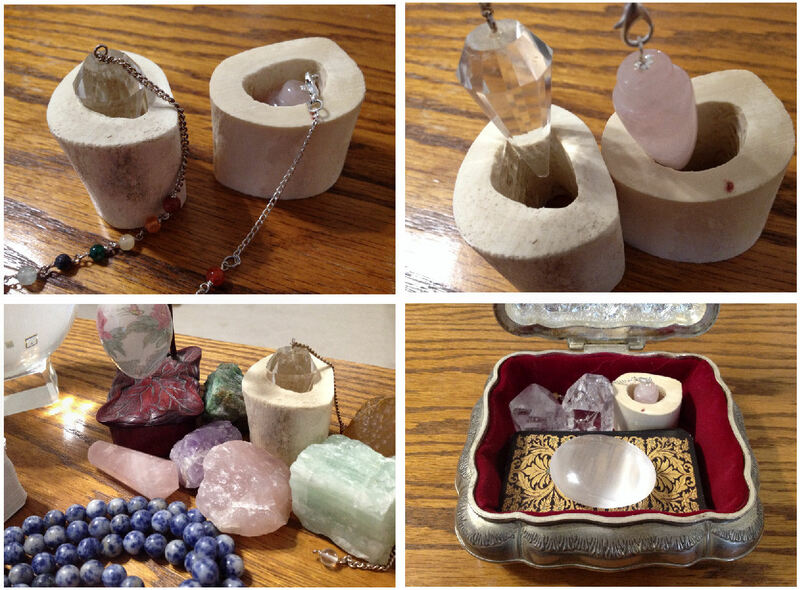 They’re great for incorporating into crystal grids, if that’s your thing. To supplement exercises toward manifesting intents related to health or healing, incorporate these bones. Some like to soak the bones for a few nights in red wine to dye the bones red, which is believed to infuse the bones with even stronger energetic support for health and healing. If you can get your hands on red ochre, mix the red ochre with the red wine for a more vibrant red hue. Personally, I prefer them au naturel, without the red. I don’t feel this practice would jive for me. I do like how you are recycling. I’m glad the use for the spine bones (?) works for you. Benebell this is such a great idea. Ugh I love your blog!!! Also, the feeling is mutual! I love your writing at “Beyond the Passing Clouds”! Do you ever plan on writing a book? Oh my, I don’t know. A book is too much pressure! Haha I think I want to start small, with my blog, and then maybe think about a book.